If you like classical music, you’ll love the Northern Neck Orchestra! They’ve been bringing exceptional performances to Kilmarnock since 1991, and each one is better than the last. Their symphony of sounds is enough to take your breath away and leave you in awe. Make sure you don’t miss out this year when they perform music from the talented minds of Joseph Haydn, Aaron Copland, Mozart, and more! And, after the performance, continue your Northern Neck adventure with the help of our free Vacation Guide! We included our favorite things to do in the area, and we hope you enjoy them as well! Enjoy the Best of the Northern Neck! What Is the Northern Neck Orchestra? The Northern Neck Orchestra is a team of talented musicians that performs three to four concerts each year in the Kilmarnock, VA, area. Their members include young, up-and-coming performers as well as professionals with years of experience. Together, they create beautiful sounds you have to hear to believe! Every orchestra needs a conductor, and the Northern Neck Orchestra has a remarkable one. Michael Repper is no stranger to Carnegie Hall, and he has even performed in countries around the world, including Italy and Australia! He is also very influential in helping young musicians flourish. He has taught at Stanford University, started a youth scholarship at the Chamber Music Society of Maryland, and regularly works with the New York Youth Symphony. Best of all, he’s the Music Director of the Northern Neck Orchestra, meaning we get to enjoy his talents right here on Virginia’s Chesapeake Bay! There are several reasons to visit our area during the winter, and this concert is one of them! From March 22nd to the 23rd, you can watch in amazement as the Northern Neck Orchestra performs works by Haydn as well as a variety of American composers like Aaron Copland and Gwyneth Walker. Plus, you’ll get to hear the winning music from their Composition Contest in Virginia! On May 25th, be sure to attend their performance at the Lancaster Middle School Theatre. This will be their last one of the season, and it’s sure to be fantastic. You’ll hear them perform music originally by Robert Schumann, Clara Schumann, and Mozart. The talented Vijay Venkatesh has experience with orchestras across the country, and he will be on piano for Clara Schumann’s Piano Concerto. It’s going to be a memorable evening! If you’d like to watch them perform, you’ve made an excellent choice. Luckily, getting tickets is easy! You can purchase admission to individual shows for $30 via their ticket page, mail, email, and at the box office on the day of performances. No matter how you get your tickets, you’re in for a real treat! Catch a Show When You Stay at the Hope and Glory Inn! Make the most of your visit to the Northern Neck by enjoying the best lodging in the area! 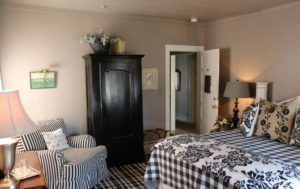 In the beautiful small town of Irvington, you can find the Hope and Glory Inn, home to elegant accommodations, a top-rated restaurant, and a beautiful vineyard just a short walk away. Plus, we’re near all of the things to do in Kilmarnock, so you can enjoy the best of both worlds! When you step inside Room 4, you’ll quickly realize why guests come back again and again to our peaceful paradise. We made sure every detail was perfect from the elegant decor, cozy reading chairs, and a beautiful queen-size bed. When you’re not lounging in your room, you can also enjoy a professional massage in our spa! Whether it’s a relaxing retreat or a romantic getaway, a stay at the Hope and Glory Inn is always special. Reserve your room today!